Here is a brain-dead easy finger food that would be great for entertaining. Isn't there some big game coming up? Anyhow... What could be simpler than canned flaky biscuit dough rolled out to six-inch rounds, filled with pork then brushed with an egg wash and sprinkled with a little chili powder? Wisk the egg white and water together in a small bowl and set aside. On a floured work surface, roll each biscuit into a six-inch round. Place about 1/3 cup of the pork on one half of each round and sprinkle it with a dash of the seasoning. Fold the exposed half of each round over the filling and pinch and roll to seal the edge. Arrange the pockets on a sheet pan leaving about an inch between each. Cut a one-inch slash in the top of each pocket. Brush the top and seams of each pocket with the egg wash and sprinkle with a little chili powder. Serve with barbecue sauce for dipping. I made these tonite as a way to use up so leftover frozen pulled pork. They came out wonderful.. I overstuffed a little, so they weren't as pretty as yours. But even my 5 year old loved them and requested leftovers in her lunch tomorrow. These look awesome! Will definitely have to try them out. I love food like this for parties. Making these for a church pot luck tomorrow. Cooking my pork with an apple and ginger-ale. Thanks for the recipe, John. 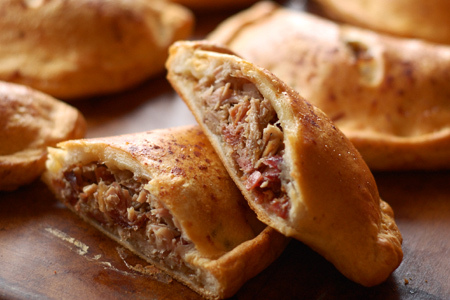 These turned out great with my scrumptious pulled pork and a sprinkle of shredded mozarella! 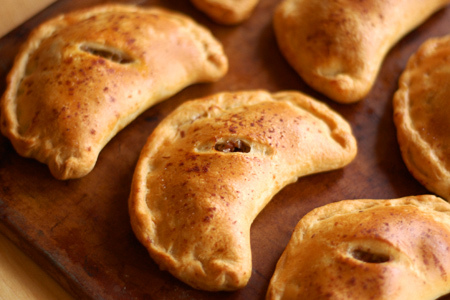 I will keep this recipe in mind as an avenue for versatility with different ingredients: chicken pot pie pockets; chorizo, potato and cotija cheese; and apple and cinnamon. This sounds absolutely delicious, thanks for putting this up. I want this in my mouth right now!